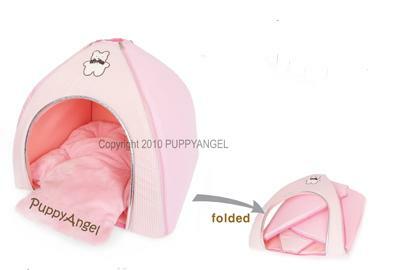 You and Your tiny pooch will adore the pastel coloured Puppy Angel Bear Camp Houses. Made from a supersoft cotton blend the outer shell has two polkadotted and two striped panels while the inner cushion is of solid pastel solt velboa. and matches the Smiling Bear and Sweet Bear Toys. It also matches the summer Compact Cooling Mats and Bear Toys.